According to the Hyatt, they were terminated for "stealing company time." The hotel alleges that they took ten minutes too long on their lunch breaks. The Reyes sisters explain that housekeepers are assigned so much work that they frequently do not have time to take their legally-mandated, 10-minute break in the morning. It is routine and long-accepted by management for them and their coworkers to take an extra ten minutes during lunch to replace their missed break. Their story begins in September during "Housekeeping Appreciation Week." On arrival to work, Martha was greeted with a collage of her and her coworkers' faces digitally altered onto the bodies of women in bikinis. She was horrified and took down the picture of herself and her sister, Lorena. Though it's commonplace to see images of scantily clad women in the media, Lorena explains, "In my culture I was raised to be conservative with my body. I don't like bikinis" I felt very uncomfortable knowing my male coworkers were looking at that." 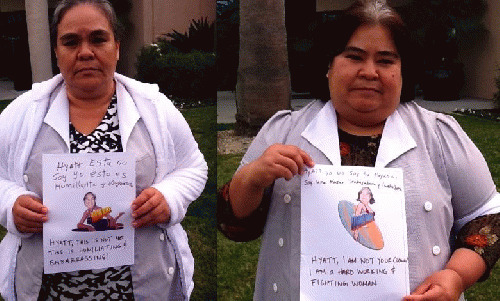 On November 18th, the Reyes sisters filed retaliation charges with the U.S. Equal Employment Opportunity Commission. Their lawyer, Adam Zapala, states, "[The Hyatt is] retaliating for [Martha and Lorena's] opposition to their pictures. You have two long-term employees, with sterling work records, and then all of the sudden, they're terminated. And they're sisters. And then you go talk to other workers and they say they do this too [if they miss their morning break] and they're not disciplined." Martha and Lorena allege they were fired for standing up for themselves. And it has cost them. Because her husband has been laid off, Lorena is the sole supporter of her husband and three children. Martha has five children as well as legal custody of three grandchildren. Like many Americans, without this job, she is also worried she will lose her home. Victoria Guillen, a worker at the Grand Hyatt San Francisco, recognizes the pain that the Reyes sisters are experiencing. In February of 2010, Guillen was fired because she was unable to meet the Hyatt's demand that she return to work only four days after having a medically required caesarean section because of her high-risk pregnancy. Though these two stories involve different people and circumstances, the heart of the matter is the same: power. Martha explains, "I go to work and I'm very serious at my work. When managers ask us to participate in various activities I participate. But I feel in this case, management is abusing its power." Hotel management frequently relies on disrespect, humiliation, and fear to maintain power over their employees, power over wages, and power over benefits. Firing the Reyes sisters and Guillen sends a message not only to them, but also to their co-workers. If people can be fired for preventing inappropriately sexualized pictures to be displayed or for simply having a baby, surely behavior such as taking a sick day, demanding safe working conditions, or a living wage, would be punished with even worse. What's notable is that both hotels that the Reyes sisters and Guillen worked for are on the list of 17 Hyatt properties that workers, clergy, unions, and community members have been boycotting because of poor labor practices.